Protect or unprotect files in Excel. 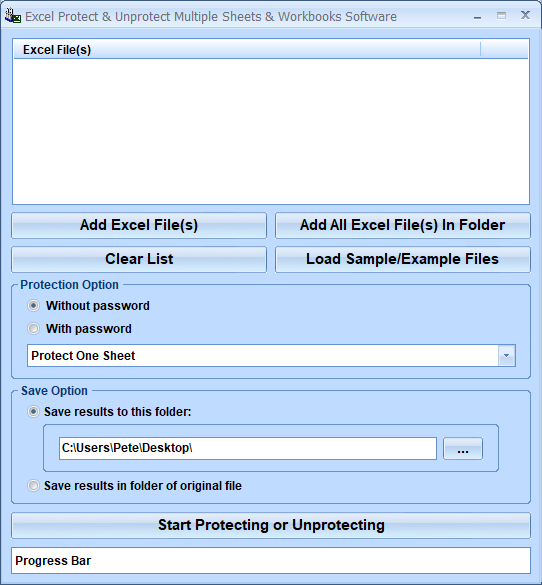 Excel Protect & Unprotect Multiple Sheets & Workbooks Software offers a solution to users who want to protect or unprotect one or more sheets in MS Excel files. Simply drag and drop the XLS, XLSX, or other Excel files you would like to work with and click a button to begin. The features for this software include: Protect One Sheet, Protect All Sheets, Protect Workbook(s), Unprotect One Sheet, Unprotect, Unprotect All Sheets, and Unprotect Workbook(s). You can protect/unprotect with or without specifying a password. By altering protection for Excel files quickly in batch, this software will save you hours of time having to open and close many Excel files. Excel 2000 or higher required. Excel Protect & Unprotect Multiple Sheets & Workbooks Software is backed by a 30-day money back guarantee. If you are unhappy with the product, simply fill out the electronic form for a refund.